Penta Support® is Penta Server doing what it takes to make a difference for every customer; a difference that will truly change the way you work. It's a promise that's deeply rooted in our belief that being a great hosting provider requires more than just the best technologies, but the best of support and service. No more call centers. No more dealing with a different person every time you need something. No more transferring you to the "expert" who transfers you to another "expert" and then on to another "expert", with none of them knowing anything about your configuration, your needs or even your business. And, most importantly, no more feeling like you're just one more anonymous customer stuck in a system that works against you instead of for you. Instead, you have a dedicated Penta Server Support Team that's built around you and your needs. It's the Team's responsibility to know and understand your configuration, your goals and you. Your Account Manager is your single point of contact at Penta Server and is accountable for ensuring all of your infrastructure needs are met. Working alongside your Account Manager—your Business Development Consultant, Systems Engineer, Support Technician, Support Specialists, Billing Specialist and representatives of Penta Server Professional Services and Data Center Operations. Combining years of experience and unrivaled expertise, they all work together with one purpose, to give you peace-of-mind. 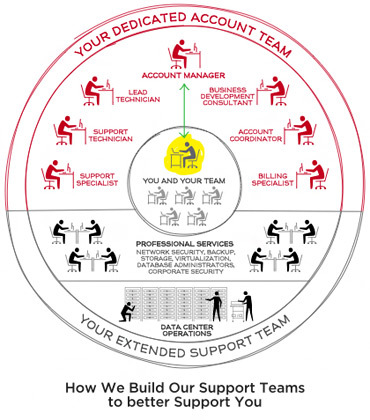 Penta Support begins with our people and the dedicated support teams we build around every Penta Server customer. From there, it filters through everything we do as a company and as individuals—our data centers, network, products, services, Best Practices, processes, expertise, SLAs, guarantees and promises. The purpose is to relieve you and your IT team from any and all of the worries, strains and unending inconveniences of web hosting. Instead, Penta Server takes on the burdens, going beyond what is acceptable customer service to what is exceptional, and often pushing beyond the exceptional to the truly inspired.